Over the last few years, Geographical Locality Studies has paid significant attention to topics related to environmental sustainability. Locality and the Global Challenges of Energy Transition carries on this tradition as the current number has been inspired by major anniversaries, such as Fukushima (5th), Chernobyl (30th), and the beginnings of mass destruction weapon testing (75th). It is, however, not a publication that systematically deals with nuclear energy, nor focuses directly on an issue that is set on environmental and social disasters related to one of the most controversial types of energy resources. GLS 4 is a colloquial effort of an international team that carried out a thorough research, analysis, and evaluation on atomic energy and its current utilisation. The papers also focus on renewables, as powerful, widely and locally available types of resources which could be used to conquer the dominance of fossil and nuclear energy in electricity generation, and reduce the dependencies of imported fuels of many regions of the Earth. Frugeo Geography Research Initiative aims at contributing to the promotion of the local, sustainable, and environmentally friendly way of utilising resources. This issue carries on dealing with the most problematic areas that have the largest ecological footprints due to human activity. 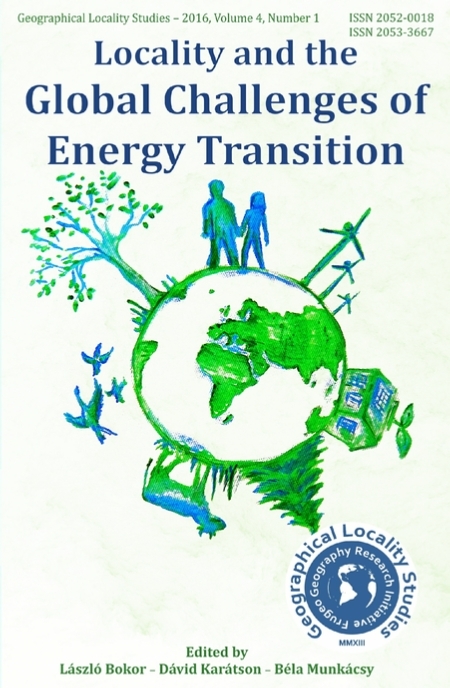 The principal aim of the journal, therefore, is to take part in this decade-long development by its own, modest way and encourage the creation of specialist papers which focus on the achievements of the energy industry solutions so far, and to offer realistic solutions for the increasingly obvious, global energy resource and the related environmental crisis. This study is based on a two-track physical analysis of the current nuclear energy systems and advanced nuclear technology concepts. In this paper, novel notions are introduced including the energy cliff of nuclear power, the thermodynamic quality of uranium ores and the CO2 trap. Based on this analysis, and considering the full lifetime of reactors, nuclear power may become in the forthcoming decades not only economically, but also environmentally unsustainable. 2. Fanni Sáfián: Modelling and Analysing the Effects of a New Nuclear Power Plant. Is there Room for Renewables in Hungary by 2030? Three energy models were created with the EnergyPLAN software for Hungary for the year 2030: An Official one, based on the Transmission System Operator’s projections; an Alternative one, based on Energiaklub’s energy vision; and a Hybrid one which blends the first two. In this research, the effects of the new nuclear power station units in Paks and the possible scenarios are investigated and compared. The aim of this research was to calculate the sustainable portion of the renewable energy potential for Hungary, considering both ecological and technological limitations to provide information for long term planning processes focusing on local energy solutions. In this paper, the most important aspects, the multidisciplinary and spatial approach involving technical knowledge and branches of natural and social sciences, are presented. This paper, on the one hand, is focusing on the availability, utilisation and importance of all locally available energy resources in the United Kingdom, written in a school textbook style; it, on the other hand, also ventures into understanding the reasons behind their decline or growing usage, and how and why these have changed over the last few decades, presented in a philosophical–academic style. 5. Katalin Juhász-Dóra & Gábor Michalkó & Katalin Ásványi & Melinda Jászberényi: Analysing Website Communication of Green Hotels with Respect to the Use of Renewables. How can they Increase Competitiveness? The aim of this study is to analyse how the different forms of the available renewable energy resources are utilised in Hungarian hotels. The study also explores to which extent the utilisation of renewable energy is communicated through the websites of the assessed hotels. Using the example of wind power plants in Slovenia as a case study, this paper identifies the landscape factors which should and could be considered, and discusses how these could be employed in planning the renewable energy facilities. The energy evolution demands an extensive presence of storage applications, in both regional and local levels. The battery storage is the simplest solution but the financial part of the applications can be demanding; therefore, this research is focusing on some alternative technologies and their spatial dimensions.